Gift from Brian, originally uploaded by DianthusMoon. For the last few days we’ve had blahness-rain and chilliness. I was doing well cleaning out the gardens, did some weed whacking, even though the spool thingie kept unwinding on me and I had to rewind it a number of times. I need to pull or dig up the weeds I missed plus edge the gardens before I will plant anything new in them or add ornaments. Bri and I were in Big*Lots a few days before our 26th anniversary and I loved this gnome and mushroom packaged together. He gave me them as a gift and I had to add them to the garden. The ferns are popping up all around them as you can see! I probably have a clematis and iris blooming right now-so early! Not done cleaning in either garden they are in. I’m trying to get more serious about my health and want to get out and walk my tail off! LOL I was trying that bicycle exercise where you lay on your back and do pedal action, but of course I pulled something! I need to stretch first! What a cute gnome set. 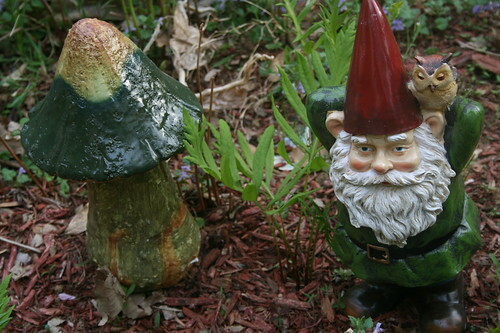 He will be a nice addition to your garden. How sweet of your husband to bring him home for you.